Rinnai Australia has acquired Specialized Engineering Pty Ltd (SE), a Perth-based manufacturer of commercial and industrial air conditioning products, strategically complementing and expanding Rinnai’s HVAC offering. With backing from Rinnai Japan, Rinnai Australia’s SE acquisition follows a pattern of recent growth including the additions of the Brivis Climate Systems and APAC brands in 2015. SE manufactures a broad range of high efficiency, super flexible and reliable products based on the Carrier and APAC legacy product sets. These include rooftop packaged systems, large capacity ducted split systems, vertical packages and split units as well as other customised products and spare parts. 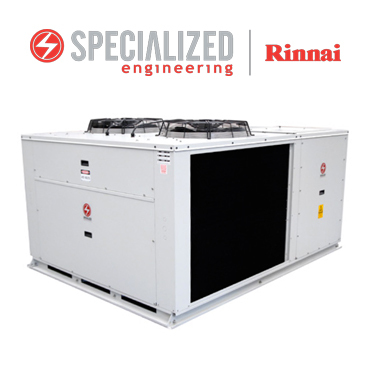 Combining SE’s innovative approach with Rinnai’s engineering and manufacturing expertise within Australia, with direct ties to Rinnai Japan’s technical clout, will see SE become a major player in the broader HVAC market. The acquisition will see Rinnai supplying a fuller range of heating and cooling products. Starting from a small residential panel heater of just 1kW, the range now extends up to large commercial packaged and split products over 160kW in capacity, effectively covering the construction industry, the retail and specialist markets and all-important aftermarket sectors. Chris Miller, the Director and founder of Specialized Engineering Pty Ltd has joined the Rinnai executive; Chris is facilitating the smooth transition to Rinnai ownership, and managing the Commercial HVAC growth and expansion plans going forward. “When founding Specialized Engineering Pty Ltd in 2008, our aim was very simple, to break boundaries, and set new standards in product and service excellence. We are building a reputation that attracts customers across all sectors, providing a high quality, reliable and versatile range of climate control systems.